Singles Knockout - Bernard Vasey (but William Atkinson is shown on the trophy). Doubles Knockout - Jimmy Middlemas & Ian Russell. Open Five Competition winner - Denis Thompson. Heaviest Fish in competition - Paul Kilpatrick 10 lb 02 oz. Heaviest Fish out of Competition - George Middlemas 11 lb 03 oz. Christmas Match - Denis Thompson. Greatest number of fish - Denis Thompson 70 fish. Heaviest Bag of fish in competition Bob Eglon 21 lb 14 oz. Seasons Total Weigh in - 987 lb 04 oz. Total number of fish - 452. Notes:- PDH 15-12-2012 from ledger. 29th September 1991 - Heaviest Bag of Fish - Bob Eglon 5 fish for 21 lb 14 oz. 30th October 1991 - Denis Thompson 1 fish for 8 lb 05 oz, 5 fish bag of 17 lb 15 oz. 3rd November 1991 - Paddy Hoy 1 fish for 9 lb 05 oz, 2 fish bag of 10 lb 15 oz. 1st December 1991 - Paul Kilpatrick 1 fish for 10 lb 02 oz. 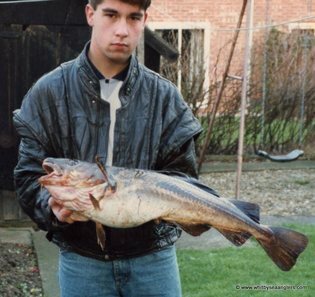 Between 12th - 15th January 1992 - George Middlemas Heaviest Fish out of a match - 11 lb 03 oz. 16 members entered and 9 weighed in. 1 fish for 1 lb 14 oz. No mention of Heaviest Fish. 1 fish for 1 lb 00 oz. Neil Inglis with his 12 lb 02 oz cod 23rd December 1991. This 12 lb 02 oz cod was caught by Neil during the Christmas match. Fishing at Gunie Hole, Robinhoods Bay, from the cliff top (as it was then) this fish was beached but became unhooked and laid on the inaccessible beach for the remainder of the match. It was not weighed in and was later retrieved by Dave Perrett once the tide had ebbed back far enough to gain access to the beach. 9 members fished and only 3 weighed in.